Doc the manatee has been making his winter home at Blue Spring State Park, near Orange City, Florida, ever since he was first identified in 1976. He has returned every year -- with the exception of the 2006–2007 season -- to spend the cold months enjoying the warm water refuge at the park. Doc seems to be fond of Blue Spring as he frequently stays in the park area right up to the very end of the winter season and sometimes stops by in the summer. In fact, he has even won the Blue Spring “Attendance Champion Award” for several years. This is an award that is usually awarded to lady manatees Phyllis or Annie. One season Doc even put in 43 appearances! An average-sized manatee, Doc is about 10 feet long and weighs between 800 and 1,200 pounds. Manatee researchers identify manatees by their scar patterns, and Doc is recognizable by the white patches on his back, sides, and tail, and also by a notch on the left side of his tail. His scars were all caused by boat hits, which is the leading identified cause of manatee death in Florida. Doc is known for visiting the swimming area of the spring run at Blue Spring, but he won’t encounter any humans during the winter as swimming, snorkeling, scuba diving, and boating are not allowed in the spring run during manatee season, which typically runs from November 15th through March 15th. Wayne Hartley, who tracks the manatees at Blue Spring, says that seems to suit Doc just fine as he doesn’t like being disturbed by humans. Doc does seem to enjoy the company of other manatees however. He and fellow adoptee Phyllis, another attendance champ, have been known to hang out together. During one season, they actually arrived and departed together on the same days. His other lady friends include Annie, Dana, Lily, Lucille, and Georgia. Doc also likes hanging out with the guys and has often been seen with pals Philip, Nick, Brutus, Paddy Doyle, and Howie. One year, Wayne noticed that both Nick and Doc even sported a patch of fungus on their tails in exactly the same location! In keeping with his name, Doc has been known to be a companion to injured manatees. One time, Wayne observed that Doc kept Robin's younger brother company after he had received some propeller cuts to his tail. Another season, Doc looked after two young manatees recovering from injuries. Although they may gather at warm water refuges during the winter, in the summer months, manatees are much more widely distributed. They travel freely around Florida’s rivers and coastal areas and sometimes even outside of the state. However, Doc must be more of a homebody as he has been known to stay near Blue Spring even during the warmer months. One summer, he was spotted in Lake Dexter, which is accessible from the St. Johns River and relatively close to Blue Spring and DeLeon Springs State Park, where Doc has also been known to make a winter appearance. In the last few years, Doc has survived record cold temperatures in Florida, although he was lucky to escape the Deep Water Horizon oil spill and red tide, which primarily affected manatees who travel along Florida’s Gulf Coast. 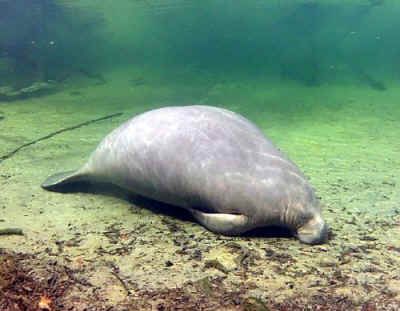 During the 2009 – 2010 manatee season at Blue Spring, the St. Johns River twice reached a record low of 45 degrees, and there weren’t many warm periods where the manatees traveled away from the spring. Doc and the other Blue Spring manatees were lucky to have the warmth of the spring waters as many manatees died from cold stress during that season. That fall, Doc made an early trip to Blue Spring in September, coming in for a visit with Lillith, Lily’s daughter. The following season, he arrived with fellow adoptee Lenny and was seen seven times from early December through mid-March. True to character, Doc arrived right at the opening of Manatee Season in November 2012, and he made a habit of coming way up the run. On March 22, 2013, he left for the season in the company of Annie and her calf, Howie, Nick, Phyllis, Rocket, and Whiskers. We are looking forward to seeing him open Manatee Season again this winter!